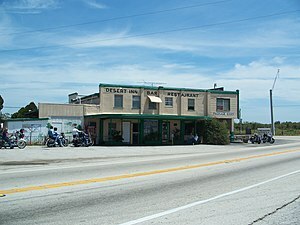 The Okeechobee City Hall is in Okeechobee on SR 70, near the north shore of Lake Okeechobee. The Mediterranean Revival building was built around 1926, at the same time as the county courthouse. It is included in “A Guide to Florida’s Historic Architecture”. See more photos here. The first time I circumnavigated Lake Okeechobee was the Saturday after Thanksgiving, 2005. I was still living in Gainesville at the time, though it was only about 3 months later that I moved back to Ocala. I was visiting Mom in Ocala for Thanksgiving, of course. Aunt Kathryn, her sister, was staying with her for a few days. I think this was after Mom had fallen and injured her arm, and I was coming down every weekend to check up on her. But after only a couple of days, I needed an escape. I loved Mom, but Aunt Kathryn and I… I could be civil and all, but she’d get on my nerves after just having dinner with her. Two days and I… Well, like I said, a break was called for. So I decided to drive all the way around Lake Okeechobee. That was one of the many things I loved about Mom. She never begrudged me my roadtrips. She encouraged them, in fact. She practically shooed me out the door that day. That trip was after Hurricane Wilma had gone through the area a month before. I saw a lot of blue roofs that day. All the blue tarps, doncha know. Pahokee was particularly depressing. A warehouse had completely collapsed. However, on future trips I noticed that not much else changed there. Hard to believe it’s in the same county as Mar-A-Lago. Talk about your extremes. The trip starts in the county seat of Okeechobee, Okeechobee, on the north shore of Lake Okeechobee. Get there from the north down US 441 or US 98, from the south around whichever side of the lake is closer. The city has only one NRHP, the Freedman-Raulerson House. It’s the southernmost site of interest in town. On US 441, you’ll start at the Amtrak station. There’s an old railroad depot there, and it’s in sad shape. Probably going to be demolished before long, unless the reno bug bites someone. There are a slew of sites, though, from the AGFHA. Highlights are the courthouse and city hall. I was annoyed that I couldn’t find the old jail, but discovered recently that it was demolished not long before I started looking for it. C’est la vie. There’s tons of fishing in the lake, hence the Speckled Perch Festival in March. If that’s your thing, this place is for you. If you want to make a weekend of it to explore the area, spend the night here. I got a good rate at the Flamingo Motel, but there’s others around. Check for pricing and season first, since some times of year the lodging is way more expensive than others. For food I recommend Cowboys BBQ and Steak Company. Make sure you get them to use the pepper mill on your food, it’s a laugh. Now you’re ready to go around the lake. The Lake Okeechobee Scenic Trail (LOST) does so, mostly atop the Herbert Hoover Dike. It’s a hiking/biking/equestrian trail. It’s about 100 miles all the way round, and takes about a week if you’re walking. I don’t know how you arrange where to stay at night, or where to leave your car overnight. There is some information about the trail here. You can find out about three of the segments here, here, and here. Continue south on US 441. There are numerous access points around the lake where you can get off the road, drive over the dike and see the lake. I suggest doing that at least once from the north, south, east and west. It’s pretty amazing gazing across a lake whose opposite shore can’t be seen. It’s like looking at the ocean. I’ve never seen sunrises or sunsets on the lake, but I imagine they’d be well stunning. Hang another left where indicated and continue to SR 710. Turn right and keep going south. Not much traffic and not much to see. Maintain the course until you get to Indiantown. It has only one site of interest that I know of, the Seminole Inn. Follow the link and find out more about the place’s connection to the British royals. South some more, then east on SR 76 back towards the lake. You’ll reach the bustling metropolis that is Port Mayaca before long. OK, not really. Port Mayaca isn’t much more than a name on a map. You’ll pass the cemetery first, where a lot of casualties from the 1928 hurricane are buried. Just off the lake is the Cypress Lodge, which is either a private home or a B&B. Appreciate it from outside the fence. The bridge over the Port Mayaca Lock is a good vantage point to see the Lake. It’s one of the few elevated points like it. Slow down, or even pull over, and take a gander. Between the towns and cities around the lake, there are houses here and there, but not much development. Which is why I like this drive. It’s one of those trips where you can just… be. Now for the downer part of the trip. Well, the most downer part. Further south is a merely blah place. As opposed to Pahokee. I’ve heard how local high school football players hope to get scholarships, so they can escape the town. I can see why. The outskirts aren’t too bad, and kind of quaint. But once you get into the town itself, you’ll be struck by an air of resignation that seems to hang over the place. There are a few sites of interest in town, but get out of your car to see them at your own risk. There is a nice city park on the lake, which may have been a state park in the past. If you need a rest stop, this is the place. It’s one of the few places in town where I felt safe leaving my car and walking around. 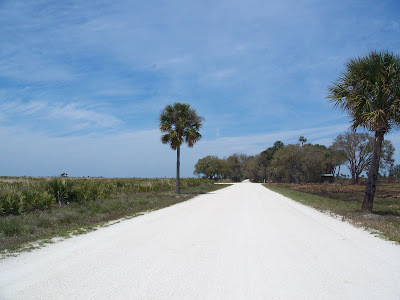 This also has one of the worst maintained sections of US 441, or any US highway for that matter, in the state. Long stretches are bumpy and rutty. I’m not sure whether it’s lack of funds or soil quality that’s responsible. Probably a bit of both. Eventually you’ll leave Pahokee and be driving on the newest section of US 441. I remember when I passed through in 2005, there was a section (maybe three or four miles) where the road curves west that was completely torn up. I mean there was US 441, then there was dirt. Obviously I had to detour. Annoying, since it was the only stretch of US 441 in the state I hadn’t driven on. Conscious. OK, hopping into the wayback machine. Destination: somewhere around 1983. While living in Gainesville, I went down to an SCA event in South Miami. I convinced a couple of friends to join me. We stayed around for a day or so after. The last night, we stayed up way late. Like after midnight. The sensible thing would have been to return on the Turnpike. But you know how I feel about that. Somehow, I managed to convince the other guys it’s be a good idea to drive back to Gainesville on US 441. From Miami. All the way. Ah, youth. Yep, driving through south Florida on US 441 was an experience, but because of the hour, the traffic wasn’t that bad. I did that first stretch of driving, since I was more familiar with the area. Once we got out of the West Palm Beach environs, it was smooth sailing to Belle Glade. I think it may have been after sunrise by this point. In any case, I let one of the other guys drive while I napped in the back. We were in a station wagon, so there was plenty of room for me to lounge and conk out. I’m not sure when I woke up, but I think it was by the time we reached Orlando. Ultimately, a trip that should have taken about 8 hours (lower speed limits back then) lasted closer to 12. But we sure saw a lot of Florida. So yeah, I’d been on US 441 along Lake Okeechobee, but I was asleep at the time. And then in 2005 they had that section south of Pahokee torn up. It wasn’t until about 5 years later that I got back and was able to drive that last bit. OK, back to the roadtrip. The next spot of civilization is the aforementioned Belle Glade. Civilized in the broad sense. It’s just so underwhelming. I guess there have to be a few dull towns here and there. You’re on SR 80 now, since US 441/US 98 split off to the east a couple miles back. Next you’ll hit South Bay. Be careful and watch the signage. If you blink, you’ll wind up on US 27 going south to Miami. Once you’re going west, there’s a fairly constant look along the road. Sugar cane fields to the left of you, Herbert Hoover Dike to the right. The dike will be on your right the whole trip, but this section is the closest and highest part. If you need to stretch, go no further than John Stretch Park in Lake Harbor. You can also go a little south and drive along the surviving old sections of US 27, if you’re not in a hurry. After fourteen-ish miles from South Bay, you’ll reach Clewiston, the sweetest town in Florida. Because of all the sugar cane, and it being the home of US Sugar Corporation and all. This would be another good place to spend a night if you want to explore the area. I did on my way to Naples, in a nice efficiency room at a motel that was less expensive than some fancier hotels I’ve stayed at. I also napped for a bit in the Wal-Mart parking lot early in the morning when headed for Miami. See, another reason I like US 27 over the Turnpike. What can’t you find inexpensive to munch on at Wal-Mart? If you want to go way out of the way, the Ah-Tah-Thi-Ki Museum is 40 miles south. I’ve not been there, so dunno what it’s like. Included for the sake of thoroughness. Heading west again, you’ll arrive at an intersection you’d expect to see in the heart of Orlando or Miami. I remember driving by it back in the ’80s, and it weren’t hardly nothing. I guess there’s more traffic coming through here now, though you couldn’t prove it by me. How times change. If you continue straight ahead, you’ll eventually wind up in LaBelle, then Fort Myers. But stay on US 27 and head north. You’ve passed beyond the land of sugar cane, and now mostly will see open fields to your left. Until you get to Moore Haven, the county seat of Glades County. First, though, you’ll pass over the Caloosahatchee Canal Bridge. It’s strange seeing such a big fancy bridge in such a small town. But the canal is part of the Okeechobee Waterway, which is a major boating artery. It connects Stuart on the east coast to the Gulf of Mexico. I imagine how many people travel through Moore Haven on the way to somewhere else. It’s like so many small towns. Folks don’t even think about where they are, only wherever they’re trying to get to. I know I did, before I learned some of its history. But if people would take a little time and depart from the road well-travelled, they’d get a sense of the history of Florida. I know I did. There are only a few spots on my list in the town. But they speak to a major tragedy in the state’s past. First is the Glades County Courthouse. After you cross the bridge, ’tis only a few blocks on the left. It’s one of the few structures to have survived the 1928 hurricane and the flooding from Lake Okeechobee that it caused. Go down to Avenue J, then head east. You’ll soon come to old downtown Moore Haven. The block-long stretch ending at the canal is the downtown historic district. And at the end is the Lone Cypress. Long used as a navigational aid, it’s a stately reminder of times gone by. Take a while to appreciate this marvel that’s stood in this spot for over a century. There’s a city park on the street too, if you need a pit stop, if you know what I mean. Apparently, the town is really jumping in March during the Chalo Nitka Festival and Frontier Days. Once you’ve finished seeing the Moore Haven that was, it’s time to head west again. If you go far enough, you’ll see a sign pointing toward the Ortona Indian Mounds. I’ll be covering that on a future post, which will be about LaBelle and points south. However, we’re not going that far, and staying around Lake Okeechobee on his trip. So at SR 78, turn right. You’ll be going north from this point on. On this side of the lake, the road veers further away from the dike than the other sides. At some spots, you’ll barely see the dike at all. Mostly prairies on you’re left. You’re close to cattle country now. I’ve not seen it, but there’s a hiking trail to the site of an old fort (Fort Center) around Lakeport. You’re now on the outskirts of the Brighton Seminole Indian Reservation. To get there, you can either turn onto CR 74, then head north on a dirt road. Or you can go on until you reach CR 721 (Reservation Road) and head north. If you take the dirt road (whose condition I can’t vouch for), the next site will be on your left before you cross a bridge over Harney Canal, about 7 miles up. If you take the better paved route, go up Reservation Road about five-and-a-half miles and turn left on SR 721A (Harney Pond Road). In 3 miles, you’ll cross over Harney Canal, and the Red Barn will be on your right. It’s one of the more recent additions to the NRHP (2008). It was one of the more difficult to find, as the address was extraordinarily vague. Fortunately, I found the NRHP nomination form, which had enough info to determine where it is. It’s in good shape, which is always nice to see. Back to Reservation Road and head north until you get to SR 70. Or head back to SR 78, then north back to Okeechobee. If you opt for SR 70, you can head east back to Okeechobee, or west to Lake Placid. Which is another post. If you’re back in Okeechobee, you made it! You have successfully circumnavigated the largest freshwater lake in Florida, and second largest freshwater lake in the lower 48. Congratulations, you. To get back where you’re coming from, you’ll probably want to get to the Turnpike. However you go, stay safe, and see you on the road! The Red Barn is on the Brighton Seminole Indian Reservation, about 30 miles southwest of Okeechobee, near the northwest shore of Lake Okeechobee. It was important to the beginnings of the Seminole cattle industry. Should you ever take a circumnavigational trip around the Lake, it’s an interesting detour. I recommend such a trip, as you get to see a lot of undeveloped Florida and remnants of tourism from back in the day. The barn was built in 1941 or 1942. The original corrugated metal roof was replaced in 2005 after Hurricane Wilma passed through. The barn is listed on the National Register of Historic Places. See more photos here.